Mom may be talking, but it's the other girl that he remembers. Page from The Boy Who Made Silence, ©2006-2007 Joshua Hagler. Two things immediately leapt out at me while reading The Boy Who Made Silence. First, I don't think I've read anything quite this Emo since Craig Thompson's Blankets, nor quite this calculated since... well, I can't remember. Joshua Hagler's tale of a boy rendered deaf and dumb in a drowning accident fairly screams "wounded child reacting to the harsh world of Mankind." That's not necessarily a complaint, and given this comic's first-issue status, there's not really enough here to render an overall judgment yet. Still, be warned: This is an inner journey of enlightenment, written in heavy symbolism. If such things make you squirm, stand back and let the story pass. Even without the discussion of Hagler's religious upbringing in the afterword, it would be impossible to miss the Christian iconography splattered throughout this story's pages. The contrast between the comic's two-so-far principal female characters, the boy's overbearing mother and the nurturing young girl who pulled the boy from the river and gave him mouth-to-mouth, puts the Madonna and the Magdalyne front and center, and the boy himself -- a fragile creature given heightened awareness by his transformative circumstances and blessed with the power to open his mouth and let out a scream that forces others to see through his visionary perspective -- is an almost stock Christ figure, containing elements recognizable in everything from the Who's Tommy to the film Powder. 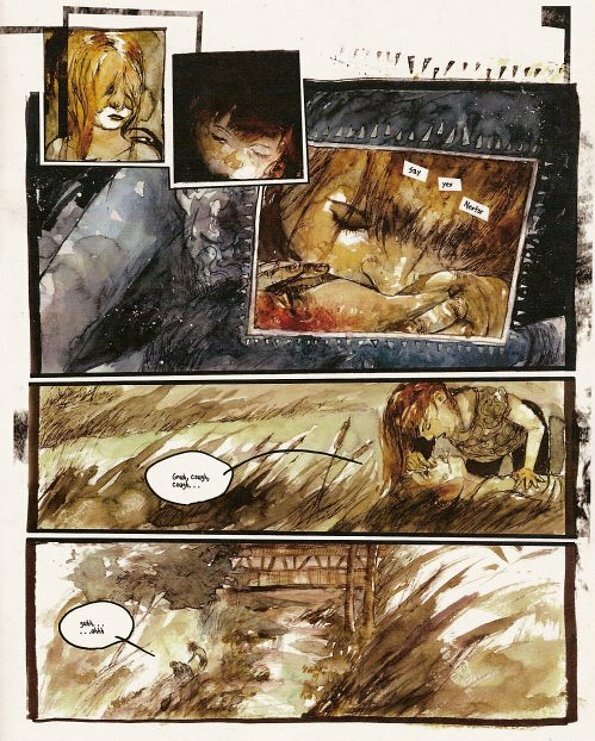 Spot the artistic influences in this page from The Boy Who Made Silence, ©2006-2007 Joshua Hagler. The other thing that leapt out at me was the immense debt that The Boy Who Made Silence owes to the work of Barron Storey and his artistic progeny. 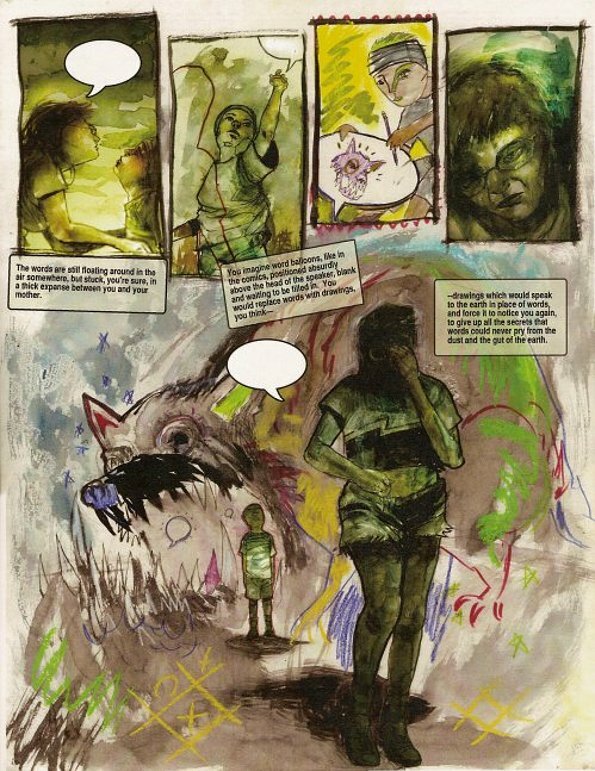 Dave McKean's book Cages in particular haunts Hagler's comic, with its painterly mixed-media formalism and layered imagery, augmented by Bill Sienkiewicz's use of child-like drawings and Storey's rows of triangles for panel emphasis. The influence seems half-digested at best; Hagler has clearly picked up some of the thinking behind Storey and McKean's artistic strategies, but there are considerable undigested surface tics strewn about as well. This isn't enough to dismiss the work either, but for those familiar with Cages or other like-minded works, it's a bit off-putting, and makes it a bit more difficult to see the story rather than the collected tropes of other artists. Still, The Boy Who Made Silence works hard to rise above the parts used in its creation, mostly through the abject sincerity in which its creator presents his tale. Hagler calls this story "deeply personal" in the afterword, and there's no reason not to treat the claim with skepticism, despite the universal archtypes and readymade set of storytelling tools. There's enough care and craftsmanship on display here to leave me hoping that future issues will take The Boy Who Made Silence somewhere beyond what one would expect from its initial outing. Hagler hasn't sold me yet, but I'm still curious to know what happens next.